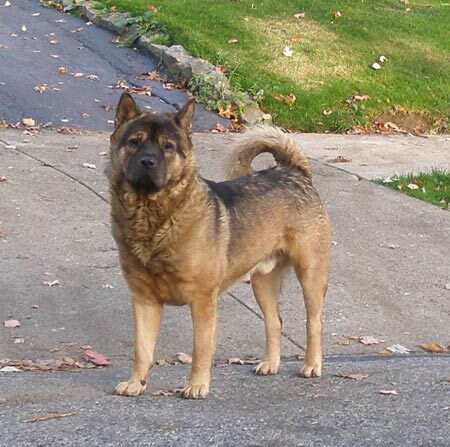 Brown looks like an Akita and German Shepherd mix. He is regal in appearance and under different circumstances I picture him called Duke, Sergeant or some other proud name. In this alternate circumstance his curly tail would stand up straight, his head would be held high as he leads his bag-carrying subject on a walk around the neighborhood surveying his land. But not so. Brown (what the neighbors have come to call him) is a stray - but not really. I believe some evil person turned him loose. I also believe he suffered much abuse because he is very fearful of people, especially men. There has to be a very special place "down there" for abusers of people and animals. Brown appeared in our neighborhood last spring. He hung around but would not get close to anyone. The dog lovers started to notice him and soon realized he was not a lost dog but abandoned. People who walked their children feared this large dog dancing around them but they soon found out that he just wanted some companionship and would not get too close. He was timid and more afraid of them then they were of him. He adopted the porch of one home as his own. Animals know about people and this kind loving family left him do so. They tried to get him into their fenced yard (they have a dog of their own) but his fear kept him away. Many of the neighbors made calls to get help for Brown. None of the agencies that were called were able to help. Some couldn't catch him. Some wanted us to bring him to them. Some wanted to charge us a daily fee to board him. Everyone is concerned. In the summer evenings neighbors who never met before or just waved a polite hello sat on the grass and visited him. He would not get close but you could tell he enjoyed the company. Some families started to put out food and water. He soon learned when people came home and would come for the food. He knows the neighborhood routines. At 5PM there is dinner at one yard and an hour later someone else feeds him. He follows the mailman, workers and delivery people. When my daughter pulls into the yard he comes to the end of the driveway, sits and watches her unload her packages. He now lets her pet him but only a certain way. A woman noticed he had some fluid around his eyes. She gave him her antibiotics pills and it cleared up. We figured Brown was about 2 years old when they dumped him. He couldn't have his shots, heartworm or other veterinary care. A man who lives down the street was willing to take him in but Brown will not get near him. He pulled his car up with his own dog in the car and left his door open but Brown would not be tricked. It was a good summer and fall for Brown, but winter came with all its fury. People put blankets and toys on Browns porch. The toys were ignored. We didn't realize he didn't know how to play. There were some bitter cold nights below zero. I'm told the people in the house with 'his porch' got him in a couple time but most of the time he was on his own and the blankets kept coming. At Christmas, a few gifts appeared on the porch. More calls to agencies were made as everyone's concern increased as the temperatures dropped, but there was still no help to be found. In January a black dog that had the chacteristics of a young German Shepherd appeared. He and Brown played. 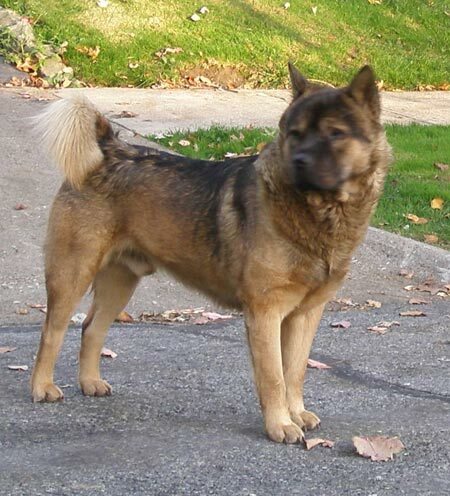 The black dog was more aggressive, and barked at people, which Brown doesn't do.. Some people were getting upset (and rightly so). We can't have a pack of dogs running around. This new dog scared the new temporary mailperson and some children playing in the snow. The police were called several times and could not catch him. Cleveland Heights no longer has an animal warden, but the police always came. About 3 weeks ago he disappeared. Whether he decided to move on or whether the police caught him I don't know. I do know that with all his aggressive behavior he never went up on "Brown's Porch". I saw Brown the other day in the rain. His heavy coat that protected him all winter was flat and I realized he was not as large as he appeared. Hang in there Brown! The time has changed - it will be staying light longer now and the warm weather is coming. Your friends will be out again soon. Dear St. Francis, lover of animals, please continue to watch over and protect Brown. Find him a good home, even though it would be a loss to us. He has made our neighborhood a friendlier place to live. Have Feedback for Pat? Fill out the easy form below. You don't have to give any personal information. Copyright � 2009 ClevelandSeniors.Com. All Rights Reserved.